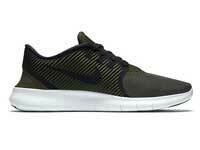 The Nike Free Run Commuter is pliable, light and takes you from the gym to your run to your everyday life with ease. Pliable and light, the deconstructed upper offers maximum packability, allowing for you to take these anywhere. 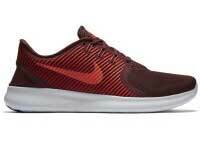 The Nike RN Commuter has a unique story for why it was created. It all started with Stanford athletes training barefoot on the university’s golf course. This caused three of Nike’s employees to begin development of a shoe that felt natural and weightless, similar to bare feet. In 2002, they examined a group of men and women with pressure-measuring insoles taped to their feet, using high-speed cameras to capture images of each foot in motion. The team spent eight years studying the biomechanics of shoeless running. 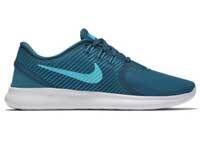 The results yielded a profound understanding of the foot’s natural landing angle, pressure and toe position, allowing Nike designers to build an unconventional and flexible running shoe from the inside out. 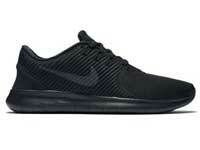 Now these look like a good walking shoe, that’s my first impression when I say the all black ones. But of course they can be used for running and all around too. Great review! Deez tight! I like dat zebra look on em. Yeah they tight bruh, especially those black ones. Nice kicks! I like the blue & black. Looks like these will last a long time. 8 years in the making! Now that one heck of a story. These shoes are on fire, gotta get me a pair! It looks like some type of velvet material is on these…or does it just look that way? Anyways, they’re smooth no doubt about that!